Thursday night is when I clean out my fridge! Friday we usually go out so on Thursday I tried to used what ever is in the fridge. 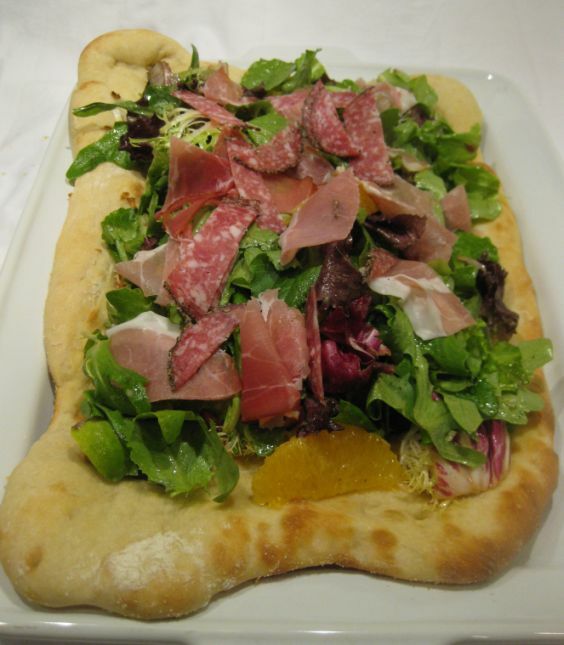 I have some pizza dough, salad and prosciutto. 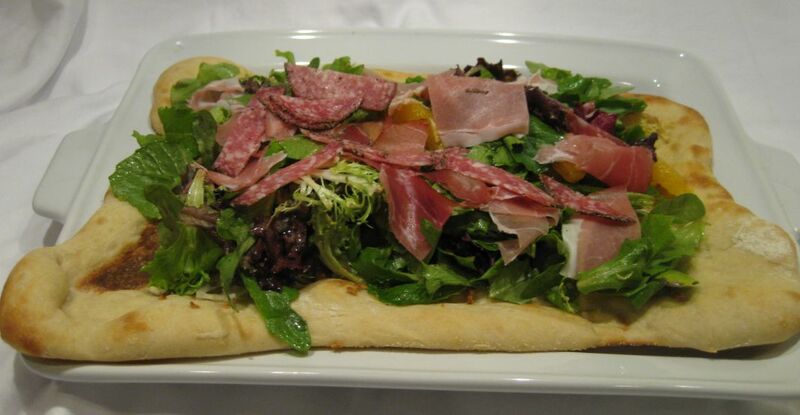 I could made a quick Salad and that is enough for me but Hoa and Kevin don't really care for salad. 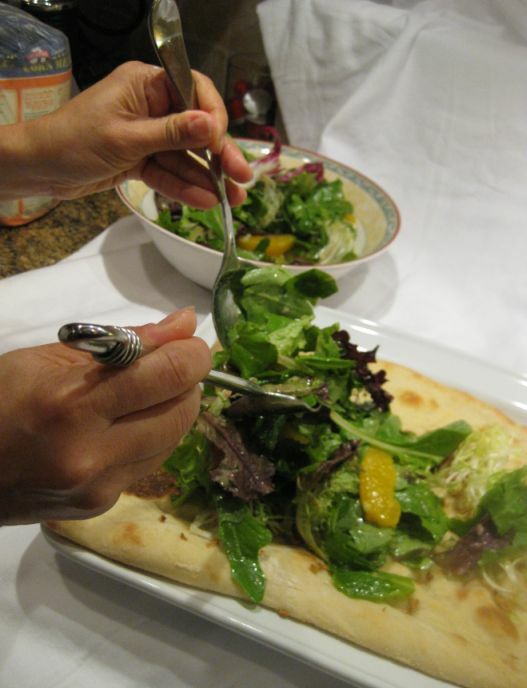 So in addition of the salad I decide to make a Piadine which is a warm flatbread from the oven, topped with a mixed salad and then you just fold the bread and eat it like a sandwich! 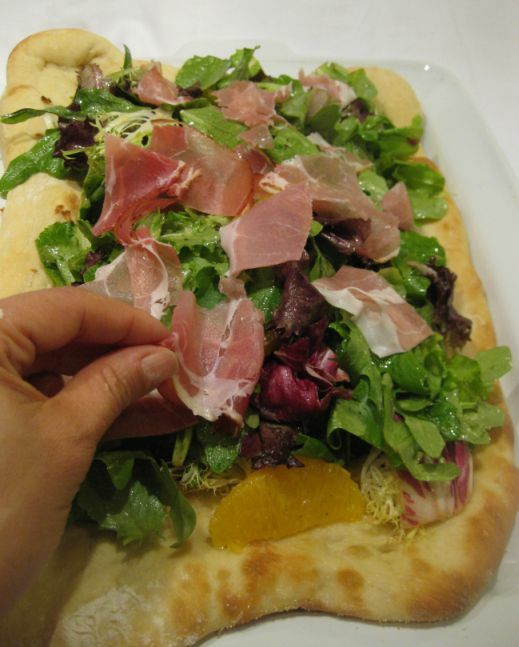 Still warm flat bread and Salad is still not enough I have to add some prosciutto on to make it a little more exciting for Hoa and Kevin. They have to have meat every day. A meal without any meat is not a real meal! 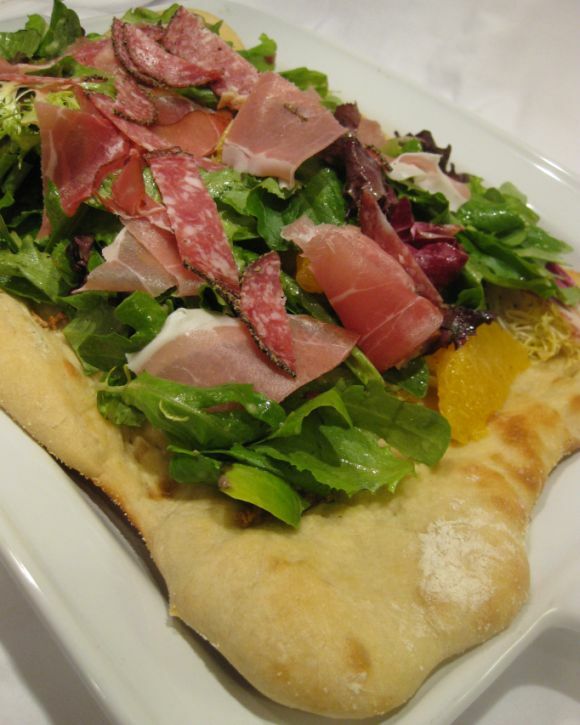 I served the Piadine like a pizza but cutting it into pieces. It is actually a very satisfying meal. 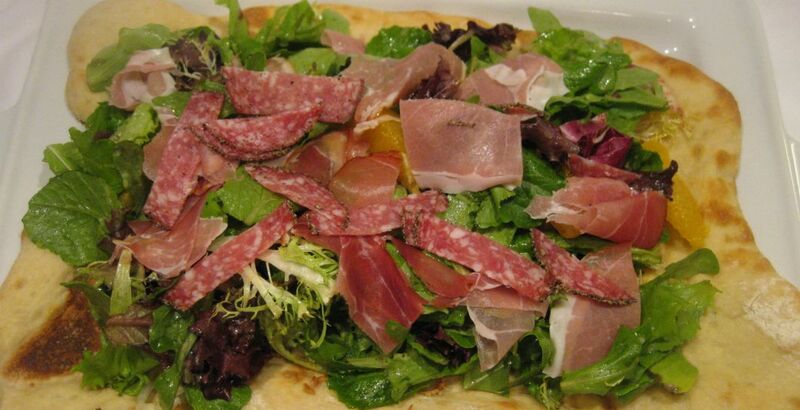 There is nothing better than eating a warm bread with some mixed salad and topped with Prosciutto and peppered salami. 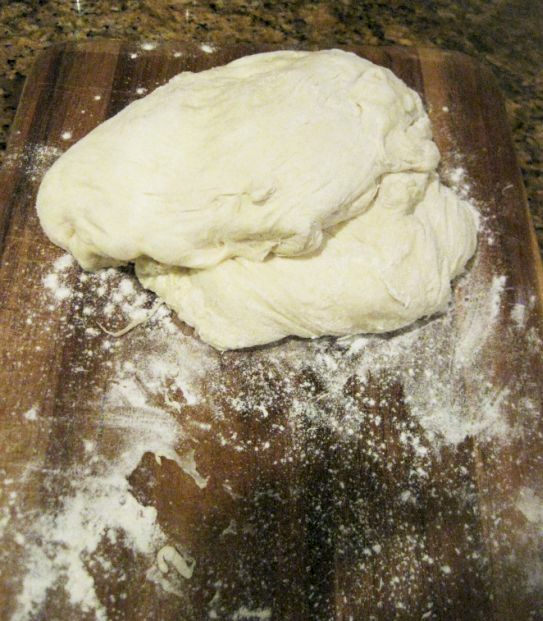 Take your pizza dough out of the plastic back and sprinkle some flour on your counter top and on the dough. 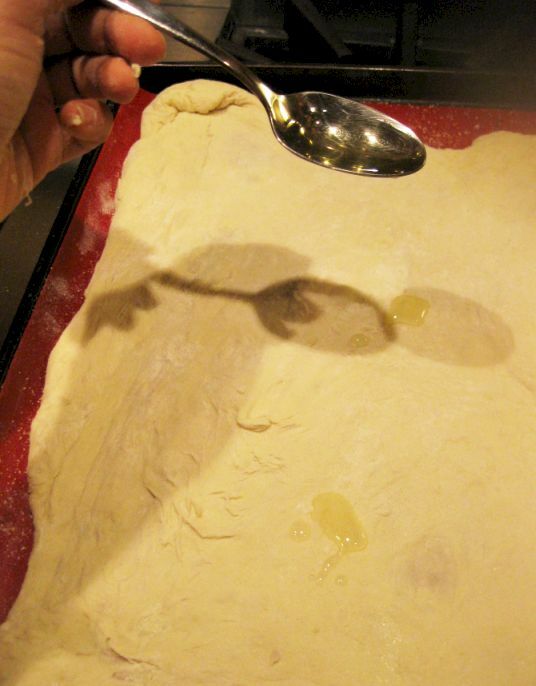 Press the dough down to form a flat disk. 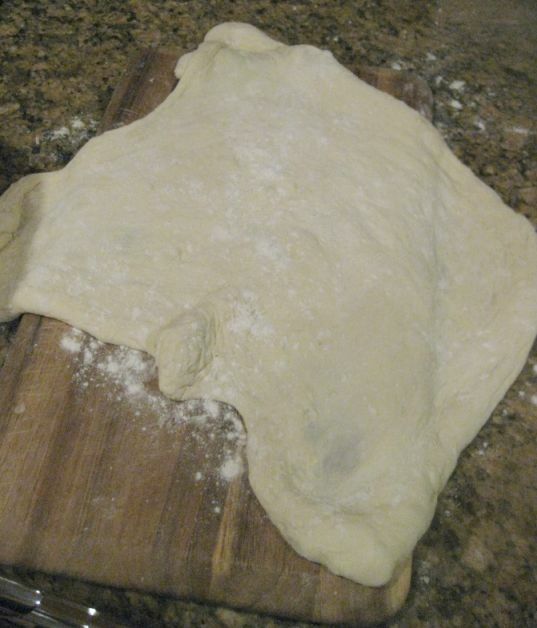 I could not make the dough into a circular shape so it became a square. 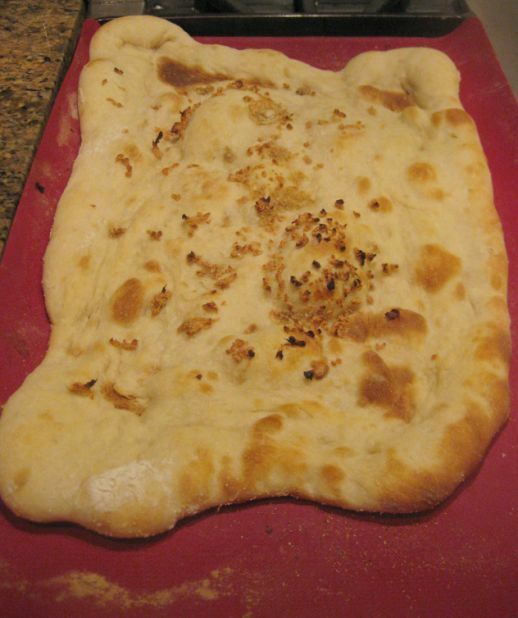 Spread the chopped garlic all over the dough and put it in the oven for about 15 minutes or so. 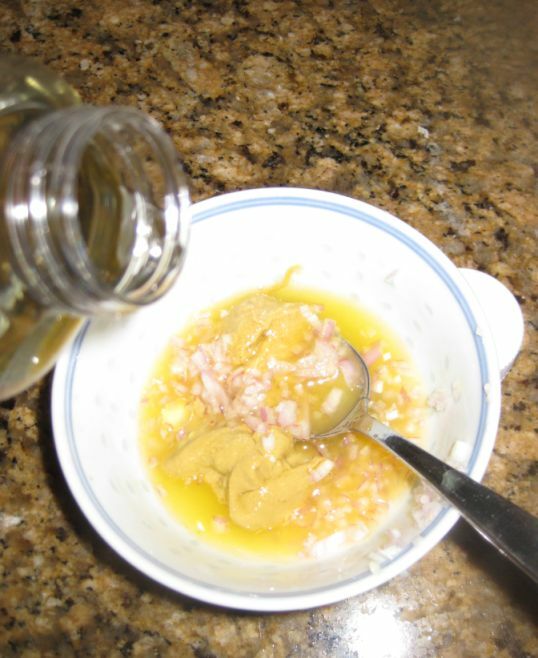 In the mean time make the vinaigrette. Put all the ingredients in a bowl. Pour the oil in the bowl and mix it well. 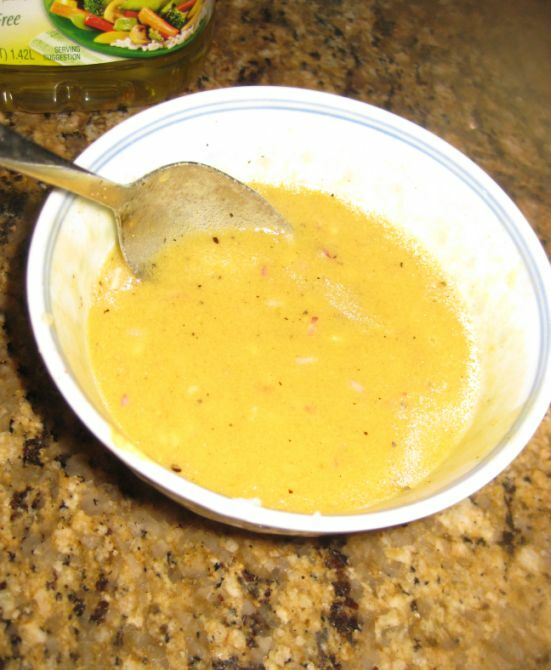 Taste your vinaigrette and add salt, pepper and honey according to taste. 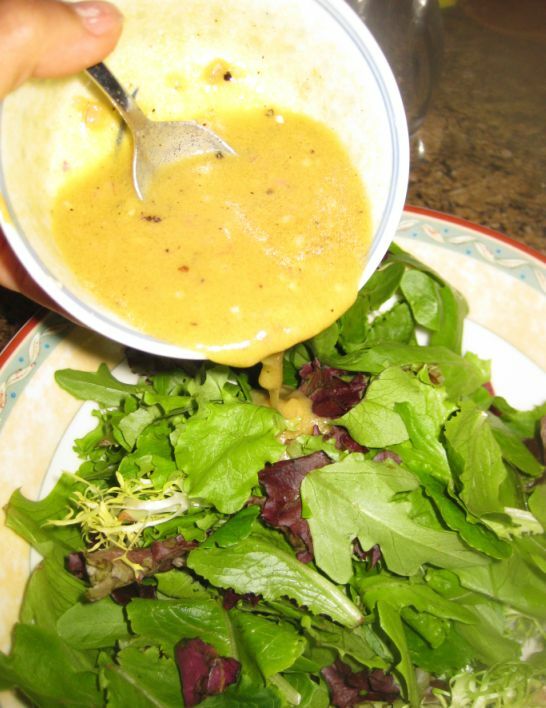 Pour your vinaigrette over the mixed green. Set aside until the dough is ready. 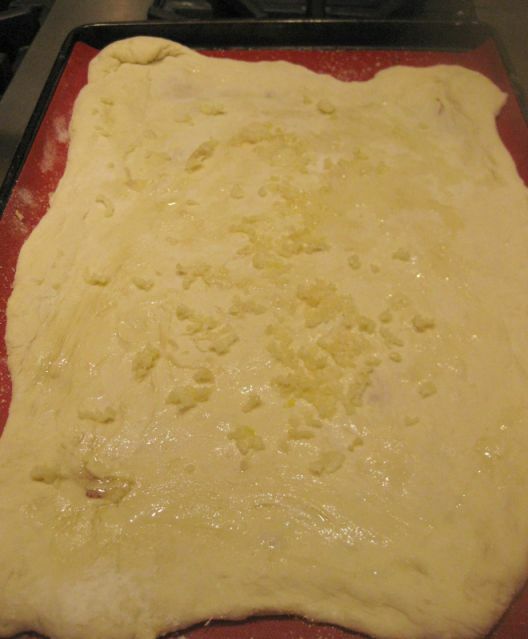 The dough coming out of the oven. 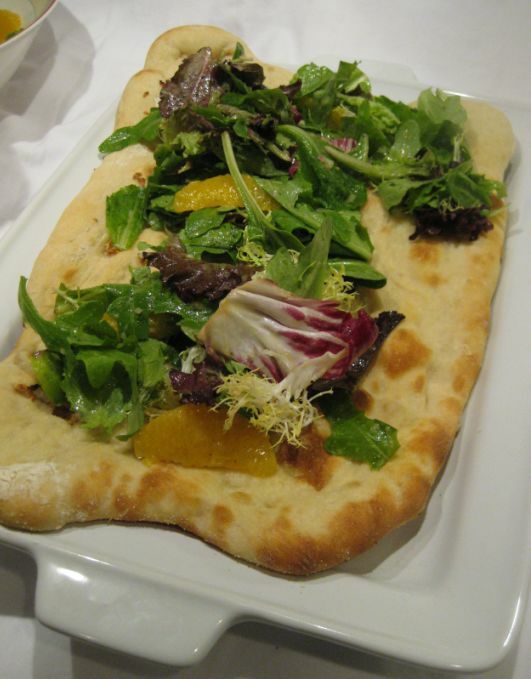 Place the salad on top of the warm bread. 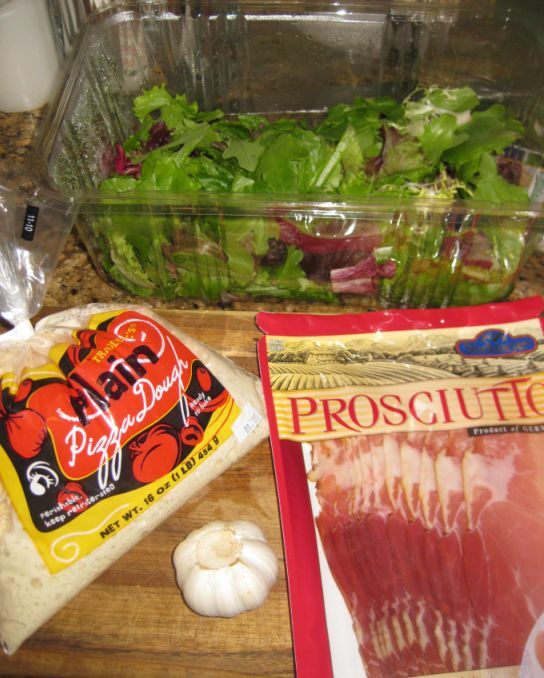 Add the prosciutto and I also added some peppered salami.